Spring has sprung with the beginning signs of warmer weather approaching. For every horse owner, the ability to spend extended time in the saddle or at the barn is a reason to celebrate after the long, cold, and dark winter. It also means fresh green grass. Horses are built to eat and graze for extended hours throughout the day. The problem many horse owners run into (especially those who have free pasture access) is the risk of laminitis, or founder, triggered by overconsumption of grasses. It’s also the time where owners are prepping for show season so it is essential for horses to be in top condition. Muzzles are usually a tool many owners resort to help keep their horses healthy (despite what the horses tend to think). Many owners have run into the frustrating issue of their horse finding clever ways to remove and then lose their muzzle. April Chester, of North Carolina, knew of this struggle personally after owning a “Houdini” of a horse who was a mastermind at removing his muzzles. With the risk of recurrent laminitis, Chester knew there had to be a better solution to help keep her horse safe and happy. “I had a friend who had a mustang who foundered and she did a ton of research and found these special muzzles in Europe. It ended up working for my friend and I then tried it for my horse and it worked wonders. He was so willing to wear it. 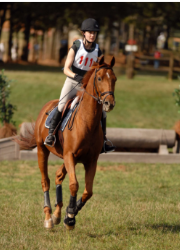 Laminitis is a huge problem where I am in the southeast area of NC. I did loads of research and contacted the manufacturer in Germany and told them how much we loved the muzzles and I wanted to sell them here in the U.S. That is how the business of GreenGuard was born,” Chester said. After four years of market testing, Chester became the sole distributor for North America. During the time of testing, she found that there nothing comparable on the market. “I used to go through muzzles once a year and this muzzle lasted years on two horses, it was incredible,” Chester said. Chester then set the goal of building a business that focused on customer satisfaction and distributing a quality product. 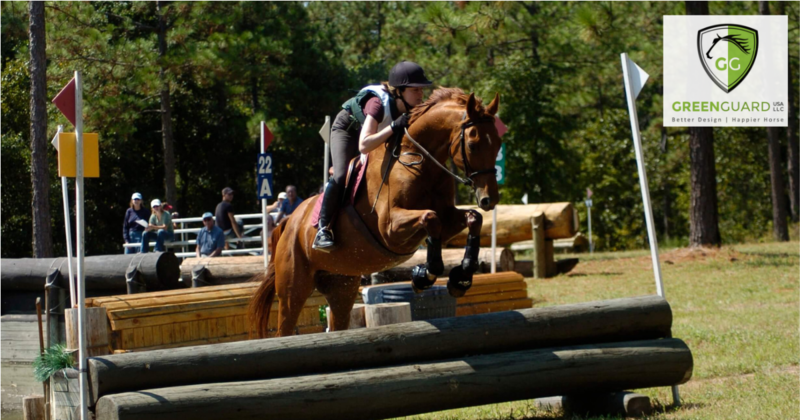 Her goal is to make horses happier and healthier while helping owners keep their sanity. 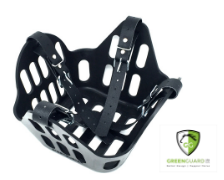 GreenGuard muzzles are special because of the intricate way they are designed. 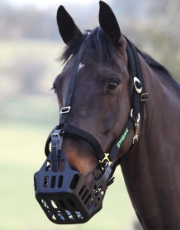 Instead of a typical round, nosing hugging muzzle, the GreenGuard Grazing Muzzle has a patented open design that allows the horse to have unrestricted breathing and drinking. It is made with a non- toxic, semi-flexible material that’s durable and doesn’t absorb moisture. It essentially sits like a small basket on a horses face and doesn’t actually cling to them in any way. This generally leads the horses to be more accepting of the device because it is actually comfortable to wear. “This muzzle doesn’t conform to the horses face while they are eating. It doesn’t rub them or affect them in a way where they can actually feel it. My horse ended up acting like he was wearing nothing. Now the shape makes sense to me as I wasn’t sure what to think of it at first. It’s made of human grade material that’s food safe and the way that the slots are designed is like a slow feeder,” Chester said. While building her business Chester knew everything at first was going to be trial and error for making sure her business took off. The biggest positive for her was having a manufacturer with experience in shipping their product internationally. Her initial approach to selling was on Amazon. “I loved getting things in two days with Amazon Prime. They have an amazing logistics and framework process that would be good for our company. It was super fast and not as expensive for fulfillment. I then really focused on customer service and building reviews because I know people trust the reviews on Amazon. After that, we began to also do Google Ads and social advertising on Facebook. This led to a substantial amount of Facebook followers. After being on Amazon, I opened up my own web store where I could interact with more customers and where it would be a cheaper option to shop for both me and my customers,” Chester said. The best encouragement Chester received about working her business was from an acquaintance who was a businessman in another field. He recommended to her the book “The Four Hour Work Week”. In it, she found great ideas for pre-launch product testing, testing before you invest in a product and the best process for how to find out if your new goal is a safe calculated risk. “It helped me learn that people really had my problem when it came to muzzles. Instead of thinking “Someone is solving this problem” I had to think “Why can’t I solve the problem”. It made me sure you don’t make assumptions that problems are already being solved. You need to back everything up with data; not just your intuition. I also had to make sure the market wasn’t too small and restrictive so that the business could have future growth. It was knowing where your market is and where your people are. If they are on Pinterest, Instagram, Facebook, or E-mail you need to be where they are at,” Chester said. Chester has also taken GreenGuard to a variety of trade shows throughout the east coast as a way to gain further exposure and talk one-on-one with customers. It’s also been a great opportunity to hear their stories and listen to their product ideas. “I also love talking to other vendors when I travel, to ask questions about how they are doing things and to get a chance to pick people’s brains. It’s a great place to learn and see how the industry as a whole is doing,” Chester said. The goal for GreenGuard is to consistently grow with the hopes of expanding into brick and mortar stores and becoming a vet preference item. Farriers have even shown interest in the GreenGuard muzzle because of how laminitis can affect horses’ hooves. GreenGuard is also moving to New Zealand, Australia, and South America. Chester consistently says she is not a salesperson, she just simply believes in how effective GreenGuard is. What brings her joy is allowing horses to have the opportunity to be horses. When horses have the ability to eat grasses in a way that is beneficial for them, it makes a great difference. An effective muzzle allows horses to have more time in the pasture, to keep their gut moving (which helps prevent colic), more movability which is great for their joints, as well as allowing them to be happier. The horse community is an ever-changing one and that also includes the people who are owning horses. 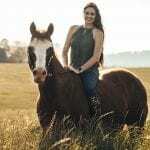 With people of all financial backgrounds enjoying the benefits of horse ownership, it has become important for owners to find the best tools and ways to take care of their animals. To learn more about what makes GreenGuard groundbreaking, visit them at GreenGuardEquine.com.